"Gypsy Rege / Leskovacka Rumba" – Marko Markovic's first release entirely in his own right shows where things are going with him: a subtle Reggae riddim, quicksilver flexible international Rumba, an unrelenting Disco beat and state-of-the-art sound design. Spells PAAAAARTY!!! The younger generation of Balkan Brass drives the genre to the next level. 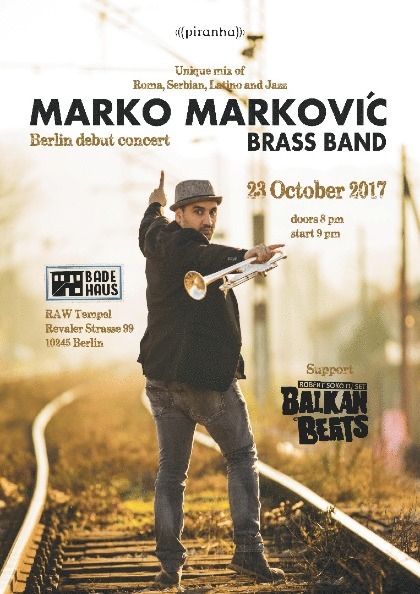 Global urban Crossover is the order of the day, on the stages for the Brass Bands from Slovenia, Croatia, Bosnia-Herzegowina, Macedonien, dem Kosovo, Albania and – as is the case with Marko Markovic – Serbia, just as everywhere else in the world. The foundation is and remains the abundant treasure trove of the regions' folk music – ballads oozing with desire and sentiment; snappy dance music at turbo speed. Left untouched is the analogue sound – conventional wind instruments conventionally played. The packaging, though, is contemporary production up to the latest international standards as in any other genre, too – with an undercurrent of beats and grooves that will make even the most resistive of anti-dancers start to itch, and a shot of everything trendy in international hipster land on top. Being the son of Balkan Brass' official superstar Boban Markovic, it's not a big miracle that junior Marko took to the trumpet as soon as he could hold it. He accepted the challenge – and came through all the way. 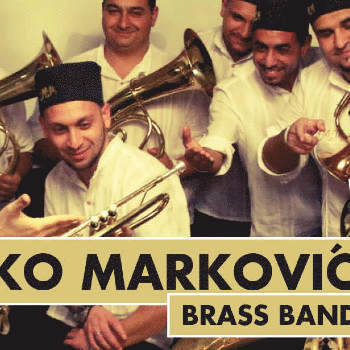 Became co-leader of Boban i Marko Markovic Orkestar, then slipped from under the family wings altogether and now roams the international stages as his own master with his own band to conquer the entire world with his Marko Markovic Brass Band. Master of Ceremonies at Badehaus Szimpla with an opening set for this night is DJ Robert Soko. 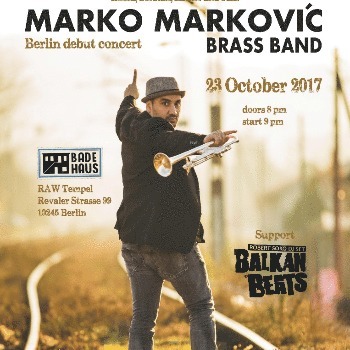 Berlin's Balkan Beats top dog, a Bosnian native who arrived in the city in 1990, originally had little to do with Balkan Brass, Balkan Pop and Balkan Rock. It was only when living in the diasporas that he heard the call of his ancestors. When he finally did, he immersed in his heritage totally - dug for the roots and modelled his BalkanBeats into a smash with the audience that has not lost one iota of its appeal and impact over the years. High spirits and dance craze guaranteed. Contemporary urban, lots of Indie and Alternative flair. And not the least bit old-fashioned Oompah style, don't worry! Just like Marko Markovic – a double bill on a par with each other entirely!